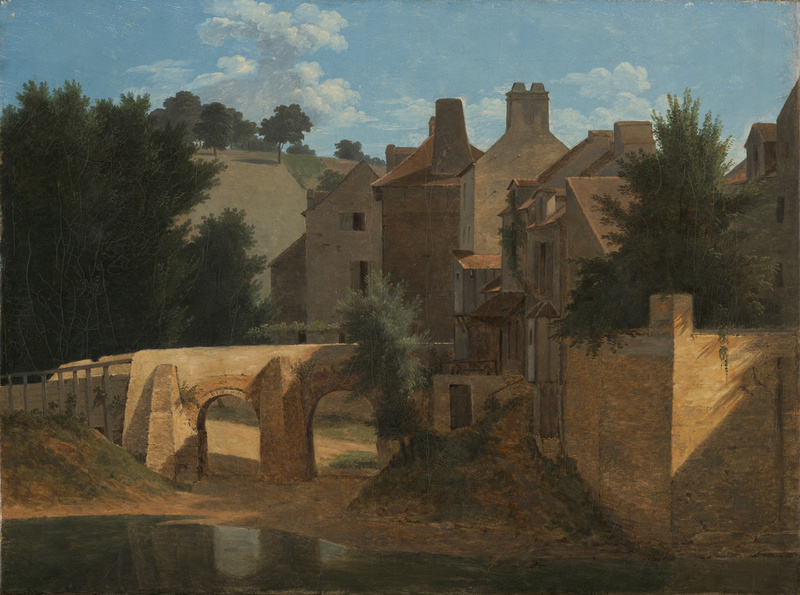 This plein air (made outdoors) oil sketch by Jean-Victor Bertin captures the graceful curve of a sunlit bridge on the outskirts of a French village in the early 1800s. A steep hillside ridge in the distance echoes this line of light tracing the roadway, dividing the image into thirds. At the painting's center, horizontal shapes meet vertical ones, created by the upward thrust of village dwellings. Interestingly, the artist's careful observation of light both enhances and obscures this obsession with geometry. Late afternoon sun throws most of the scene's natural and manmade subjects into shadow, with surprising punctuations of color and light in the sky and foreground. Bertin's Neoclassical approach to landscape painting reflects that movement's emphasis on structure and form, as evident here in a calculated arrangement of forms for overall harmony. Like other landscape painters of his time, Bertin made outdoor sketches not to exhibit them, but to record the effects of light and atmosphere so he could recreate them in highly finished works made in the studio. This sketch was meant to inform those polished yet imaginary landscapes, making them more convincing to the eye. Private Dealer, sold to Galerie Lestranger, 2007. Galerie Lestranger (Paris), sold to the J. Paul Getty Museum, 2008. Tajan, Paris. Tableaux anciens et du XIXe siècle. June 20, 2007, lot 66, ill.
Josenhans, Frauke. "Sur le Motif: Painting in Nature around 1800." Getty Research Journal, no. 1 (2009), pp. 179-82, 188, fig. 1.